Chances are that, if you're reading this, you already are familiar with Salk Sound and Audio By Van Alstine; both of these consumer-direct companies are Internet forum favorites and have huge followings amongst the techno-savvy. For good reason, I might add -- both leverage solid designers with significant experience, with the result being consistently excellent audio-show sound. That said, I've heard Salk and AVA (who almost always show together) sound more and less awesome. 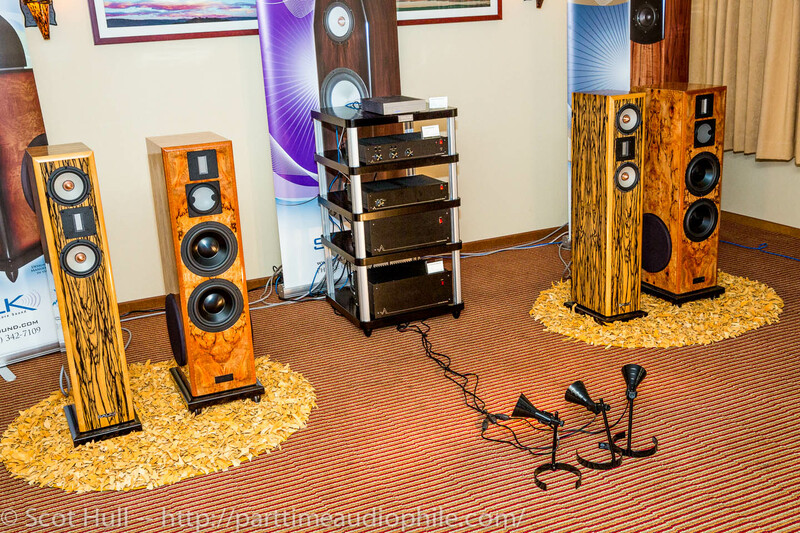 This year's RMAF, it was most definitely more. 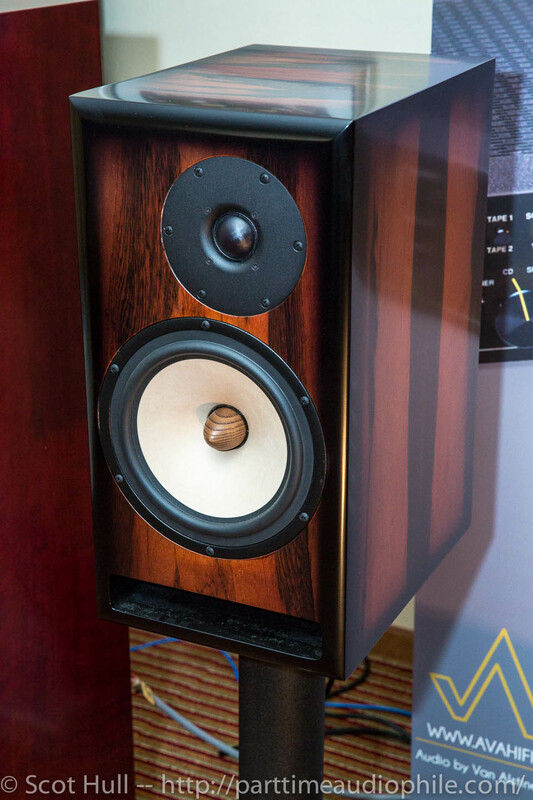 The SoundScape 8, clad in Jim Salk’s extra-special just-for-himself veneer (he get’s a little round-eyed at the thought of doing that veneer again, but could probably be talked into it … maybe), is an outstanding performer. At $7,995/pair, they’re a screaming steal of a good deal, and for that cash you get a laundry-list of features: RAAL ribbon, Accuton mid, dual 8″ woofers and dual 12″ passive radiators. And yes, they sound awesome. 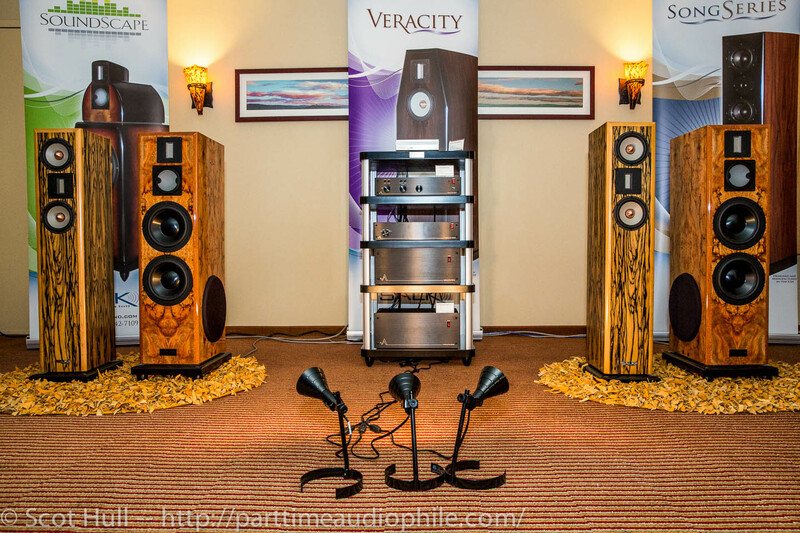 I didn’t get to hear the Veracity ST ($4,195/pair), a 2-way transmission-line design (also with a RAAL ribbon and dual SEAS woofers), but I did get to hear the system on the opposite wall, the “Exotica”, described in-room as an “experimental high-efficiency stand mount” (photo is above). A two-way slot-ported monitor, the Exotica uses a SEAS “Exotic” tweeter and woofer, for a 50Hz-20kHz frequency response at a 91db sensitivity. Better still? It sounds extraordinary. Price is still TBD, but expect $6k-ish for the pair). 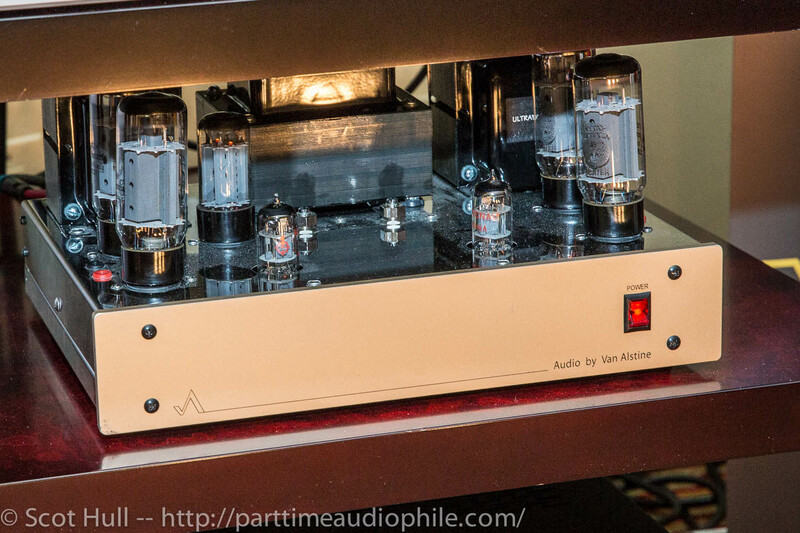 Frank Van Alstine was showing a new Transcendence Nine Vacuum Tube Preamplifier ($1,399) with the Fet Valve 600R amplifier ($3,199) on the “big” system; the new Fet Valve CF Advanced Vacuum Tube Preamplifier ($1,899) was matched with the Ultravalve Vacuum Tube amplifier ($1,999) with the Exotica. 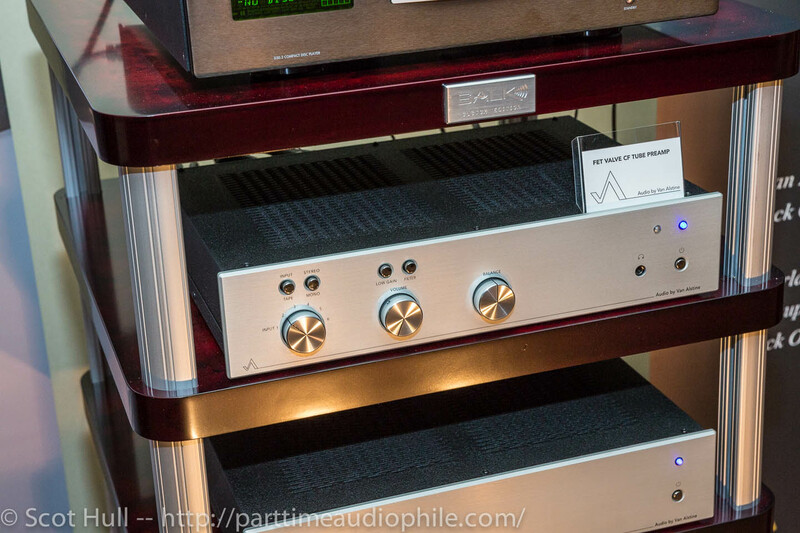 Both systems used a Fet Valve Hybrid DAC ($1,899). In short? 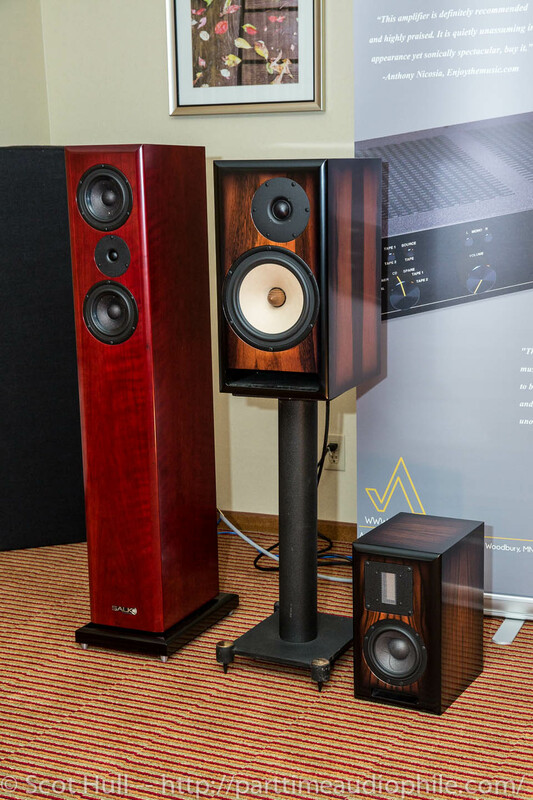 AVA and Salk Sound brought out a winner here at RMAF. Nice work! Van Alstine AVA stuff is GREAT, been using it for years all different models and versions, of DAC, Phase inverters,pre amps, amps, rebuilt Hafler P500 BEASTS! (4) running in mono with hybrid phase inverters from AVA. All GREAT! Besides, it doesn’t need magic better sounding line cords either.! sonic BLISS priced for mortals. Superbly RELIABLE, and sounds GREAT. One of the better sounding realistically priced rooms at the show. 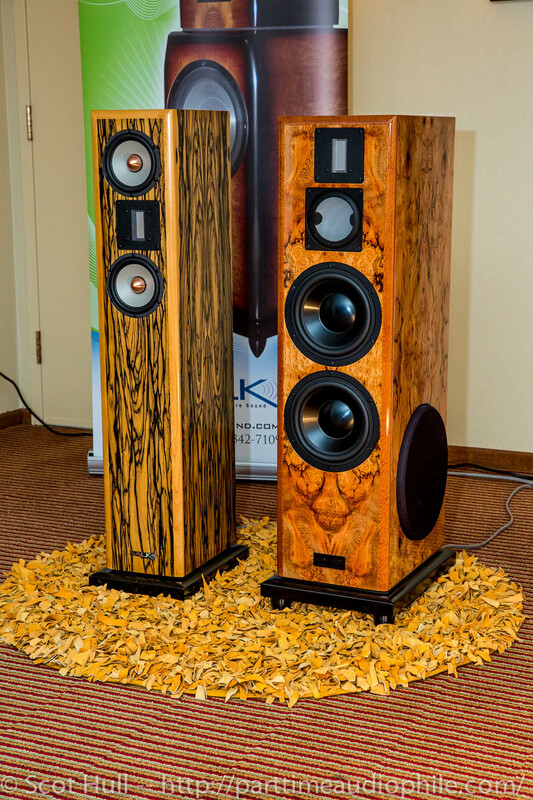 Even Scott’s great photos can’t show how great the finishes are on these speakers. It’s true. You have to go up and touch them. But then, you’re risking Jim Salk’s ray of doom. Not wise to get too close.